My initial intention had been to watch the first episode of S2 and then write the post leisurely at a later time. Honestly though, after the first episode of S2, I had no hope of not writing this tonight. I also had no hope of not eagerly awaiting the next episode, but that's besides the point. Before getting into S2, here's a little about the second OVA, which was released some time back by aarinfantasy. Given the questionable quality, I wonder when it was actually released. (It just might be that aarinfantasy didn't want to release a higher quality version, but that seems like a weird idea.) 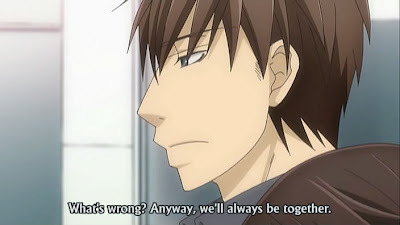 Anyway, it takes place one year after the occurrences of the first season, and focuses on Hatori and Chiaki in their relationship (with nary a mention to Yuu; ha). 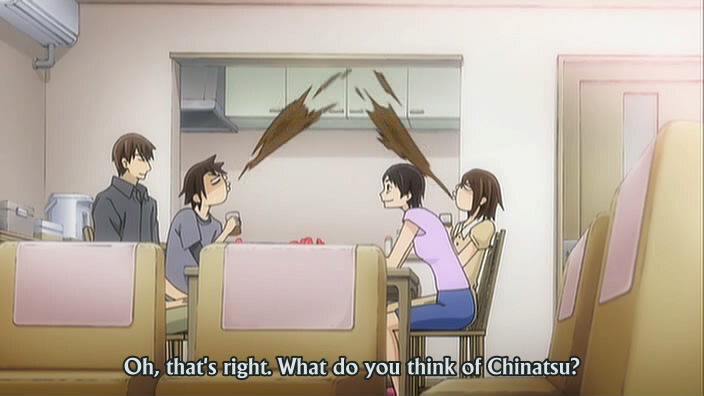 The OVA was essentially just a slice-of-life story with very little really happening. Hatori came home to find Chiaki sleeping in his bed, as if it wasn't a new thing, and the next morning saw the two going about a morning routine (along with discussing work; it's such a bad habit to not separate work and personal times). The next part of the episode had to do with visiting Chiaki's mother, who demanded that the mangaka come home every once in a while. While there, it was obvious that Chiaki's younger sister likes Hatori - either on a deep level, or in the sense that he's a man and she's a woman - and such a thought made Chiaki very jealous. It was a little sad to see the lack of development. It's not as if the two have been stagnant in their relationship, though; Chiaki clearly mentions that he thinks they'll be together forever, so I'm sure they're a lot better than the point of just hanging out together. A part of me wishes they would tackle the difficult issue of telling their parents, but I think it would either be unrealistic or ruin the mood of the series as a whole. I was also curious to see why there wasn't a more risqué scene; there usually is in OVAs. It faded away at Hatori being pleased that Chiaki was jealous at the thought of Hatori belonging with someone else (and a girl, at that). 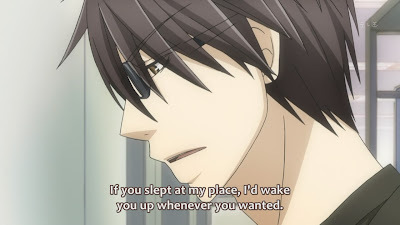 The final scenes of the OVA had Hatori questioning why Chiaki hadn't submitted the character plan for the new male in his manga (based on Hatori), and Chiaki indignantly revealing that he didn't want to draw Hatori in love scenes with other characters. His jealousy seems to be shaping up quite nicely. The first episode of S2 began with Ritsu doing what felt like a re-introduction, but it really wasn't. He had recently been promoted to dealing with the printers, which served as a reason for him to explain the inner workings of the manga editing world. 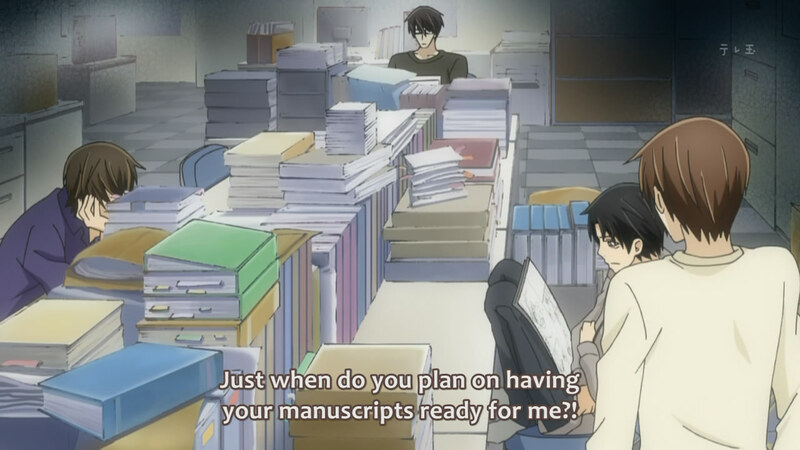 It was very cute to see Hatori and Chiaki (although the latter only showed up in voice); it was equally amusing to see that Chiaki thought writing a shifty letter to Hatori as an excuse for why he was late with the deadline would actually work. Either way, Ritsu headed home feeling dejected that no one had done their work on schedule and happy that his first published work as an editor had just been released. It was nice to see that Ritsu hadn't completely forgotten how S1 had ended, and pretty hilarious to see him try to imagine that Takano had been forcing himself onto Ritsu again. I do wonder if anyone could possibly have taken this seriously. At the end of S1, I became aware that many people had seen the entire series as some sort of vehicle for abuse and victim-blaming (probably due to what had happened at the end of ep04 in S1). This really startled me. 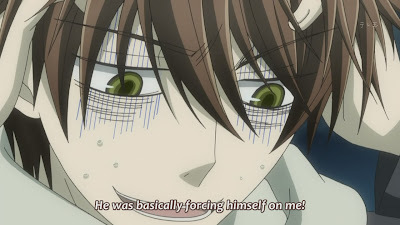 Ritsu never saw himself as a victim; he was always at a crossroads about how to feel about the assertive Takano and what he himself wanted to do. 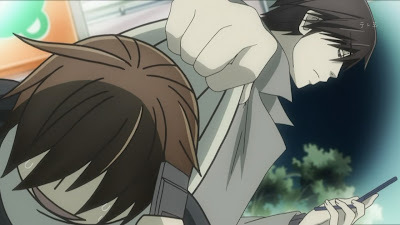 Other than that one scene - of which my only comment is that Ritsu didn't see it as a horrendous occurrence - this series was actually pretty low-key. I'm hoping that less forcing happens this series, nonetheless. That's actually a good book. I want it. 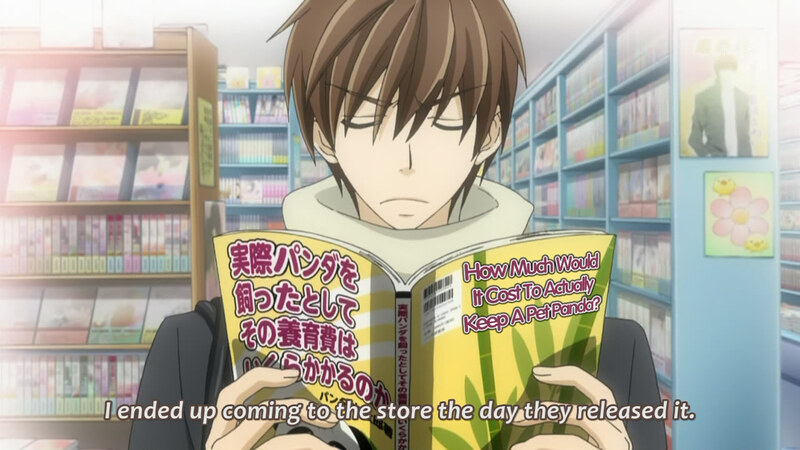 Getting back to the episode, Ritsu found himself visiting the bookstore (where Yukina works) in order to check out the first day's sales. Upon being found by Yokozawa, he was chastised for getting in the way of the Sales Department, but still allowed to tag along as Yokozawa did his sales work at the bookstore. Upon leaving, Yokozawa once again proved to be the thorn in the budding relationship, telling Ritsu to move out immediately and that his presence bothered Takano. 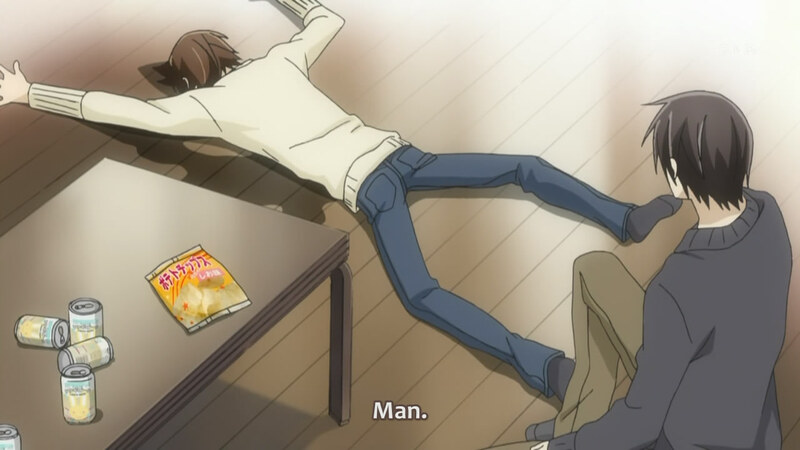 After one thing or another, Yokozawa essentially just told Ritsu that he and Takano were dating, thus sending Ritsu into an emo nosedive. He's just presenting at this point. After another day of the manuscripts not finishing, Takano took it upon himself to make a step-by-step manual on how to deal with the printers for Ritsu. He also decided that they would all celebrate the fact that Ritsu's first publication was doing so well (such that another run of copies had been ordered) and, despite Ritsu's refusal, went ahead with it anyway. This part confused me a little; I thought the entire team was going to celebrate, but those scenes were never shown. Ritsu was heading home on the last train, which could mean that a party had already happened. 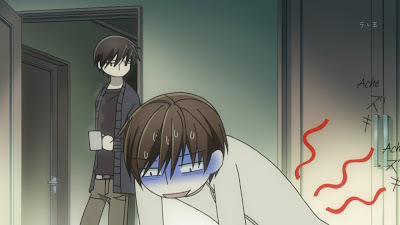 Either way, Takano accosted Ritsu on his way home and they headed over to the apartment (I found out later that it was Takano's place) to celebrate in a very chaste way. 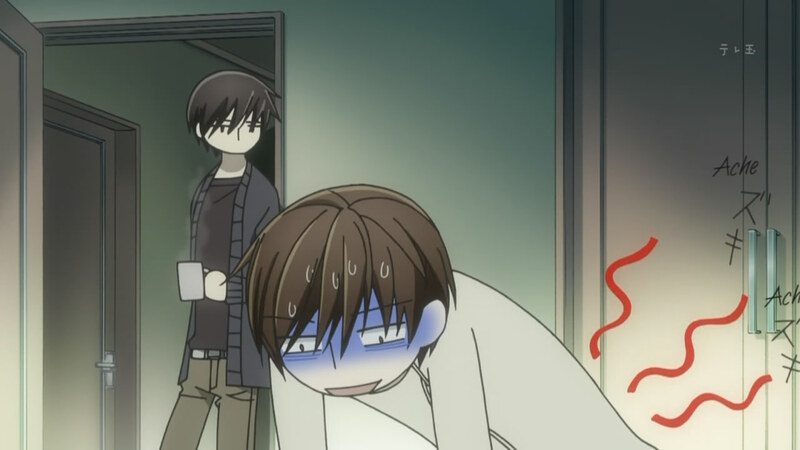 I'm really, really eagerly waiting for the next episode, and the preview makes it clear that it'll still be about Ritsu and Takano. I definitely couldn't have handled a focus shift to another couple at this point. I wonder if there will be closure, development, or absolutely nothing at all. It's agonizing!